Our beloved mom and gramma Jane passed away peacefully and went to be with her Lord on Wednesday April 5, 2017, at the age of 85. She will be forever loved and remembered by her children; John & Jeanne and their children, Jeremy & Kimberly, Jarvis & Rhea; Leona & Harold Hofstra, and their children, Trevor & Heather, Daniel & Julie, Angela & Jared Bendfeld, Kathleen & Troy Martyshuk; Nick & Pauline and their children, Amanda & Michael Opdendries, Darren & Rosalien, Kevin & Selene; Wilfred & Joanne and their children, Ashley & Lee Floor, and Nathan. 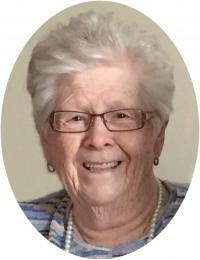 She also had the joy of being a great grandmother to 20 great-grandchildren (and 3 yet to be born); brother Arie and sister Margriet; family and friends. Jane was predeceased by her loving husband of 58 years, Fred in May of 2012. A public viewing will take place at 10:00 am followed by a family burial. A Memorial Service will be held on Tuesday April 11, 2017 at 1:30 p.m.
Ebenezer Christian Reformed Church, 49257 Range Rd 250, Leduc. "Our lives are tied together with the heart of happy memories; the joy of special moments and love that will last forever".